It's been a long time coming for the fans of Stone Sour in Edmonton. After almost eight years between appearances, the Canadian leg of Stone Sour's "Hydrograd Tour" landed them in Alberta's capital for a long-overdue visit. Though the air downtown might have been bitter cold, Stone Sour heated things up by bringing their intensity to the Shaw Conference Centre. Storming out to the stage with the glow of a lit-up sign bearing the band's Hydrograd logo, frontman Corey Taylor sauntered to the centre of the stage and guitarist Christian Martucci's axe began to wail the intro to "Taipei Person/Allah Tea," the night was off to a bang, literally. Taylor was armed with a confetti and streamer bazooka he'd fire over the crowd mid-song. Taylor flexed his chops with the trademark coarse vocal scream during "Knievel Has Landed" and powerful melodic singing in "Say You'll Haunt Me." Banter with fans gave a personal and lighthearted element to the group's performance. Taylor took a moment to highlight drummer Roy Mayorga and bassist Johny Chow, referring to them as the "meat and potatoes" of the group. Chow and Mayorga masterfully laid down a dense foundation for Stone Sour's set, shaking walls and concert goers' bones. Taylor briefly mentioned the absence of guitarist Josh Rand, as he recently checked into treatment. Performing the Audio Secrecy hit "Hesitate" injected an emotional moment into the evening without sacrificing momentum, though the song sounded somewhat choppy at the beginning. Rand's fill-in Jonah Nimoy held his own on rhythm guitar and did well to maintain the pace and energy level. They finished the night with "Absolute Zero" and the fast-paced "Fabuless," including inflatable tubemen from the video. 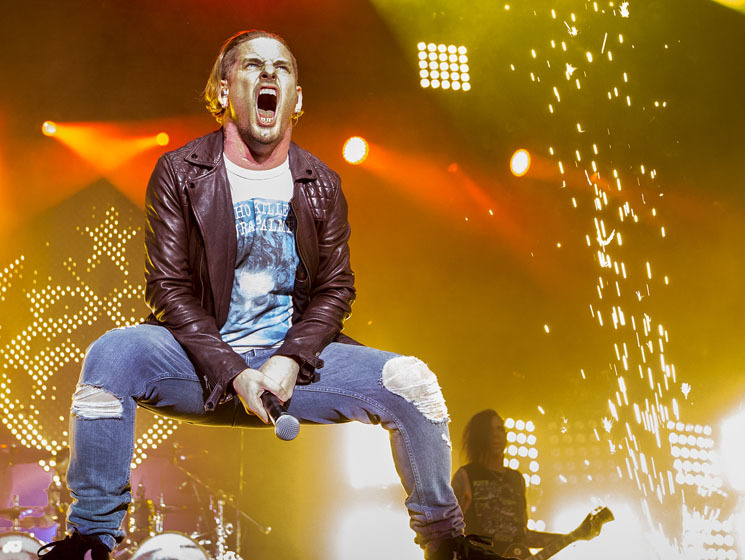 Stone Sour left behind memories that had ignited fires in concert goers' souls.